On Saturday, I finished the hat for a scarf/mitten/hat set, the first two components of which I had completed last winter. The photo of Noah proudly modeling it was in the layout from last week, but here it is again. 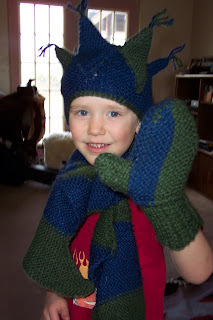 We could only find one mitten for the photo, so that is why he is only holding up one hand. Of course, as soon as I pull out the camera (which is a daily occurrence, now) all the boys want to be in the photo, and then immediately ask "Can I see, Mom?" But really, who can resist these cherubic smiles? Jude's pose says, "Hey! It's me." Jabin's speaks of pure joy. And Noah sure is proud of what his mama made for him cuz she loves him so much. Great job T! 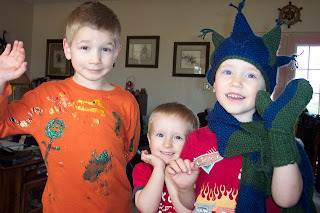 Love the points all over that knitted toque! But really now, do ya think you boys need such head coverings in that kind of weather. Oh well, you'll get more use out of them up here next winter right? Hugs! I absolutley love the hat. I want one. They look great and it is exactly what my younger kids do when the camera is near.